Patio enclosures are an effective way of extending your entertaining space and outdoor living area without the costly option of adding on a new room. Not to mention, you can choose from a variety of styles, designs, colors, and sizes for the patio area. You may choose to install a simple roof or overhang, or go for the complete package - a screened in patio with structured walls and entryways. Installing a patio enclosure is not a home improvement project that you want to tackle yourself. Take advantage of our handyman services. Not only will this save you time and effort, but you can rest assured that the finished product is safe and sturdy. Once you decide to improve your home's value by enclosing the patio, you must assess the area. How large is the area you want to enclose and how much protection is desired? The protection level can range from a roof option, to semi-enclosed, to fully enclosed. This option is convenient for homeowners with a small patio already in place. If your space is limited, consider having a handyman install a patio awning. You may choose from modern stylish retractable awnings, which extend over and beyond the patio without the need for complete structural support. You can utilize shade sails to create a patio of any shape and size. If your patio is detached, large umbrellas can provide shade and protection. A handyman can permanently install this feature so that your umbrella doesn't fly across the yard during windy storms. If you are looking for an all weather dining, relaxing, and living area, this option is for you. Whether you need a semi or fully enclosed patio depends on your preference. 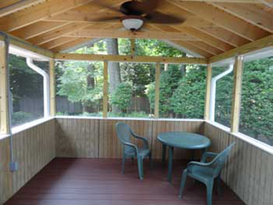 A screened in patio is ideal for providing additional shade and keeping out those pesky insects.